Gilbert Amy had been barely a name to me so I took this opportunity to hear some of his music. He was born in Paris and studied at the Conservatoire under Messiaen and Milhaud, and later with Boulez and Stockhausen. He worked as music director of the Odéon theatre in Paris and later succeeded Boulez as music director of the Domaine Musicale. In 1984 he became director of the Conservatoire in Lyon, from which I presume he has now retired. Although he has composed a number of works, I think he is better known as a conductor and administrator than as a composer. He has not been much recorded. As this sketch of his career suggests, he works in the idiom developed by Boulez in his early period and by the Darmstadt school in general, of short phrases organized possibly using serial methods and without traditional thematic statements and developments. The influence of Webern is much more in evidence than that of Messiaen. Some people do not like this idiom, but I can enjoy it if it is well done: for example, I recently listened, with pleasure and not for the first time, to Boulez’ Le marteau sans maître and Pli selon pli.The problem for me is that, unless used by someone with the fastidious ear of Boulez, this kind of music becomes impossible to follow: phrases succeed phrases, not particularly attractive and with no obvious underlying argument. The result is that even short pieces can seem long, while longer ones can become unendurable. It is not like baroque or early classical music, where there is a well-established idiom which can be used convincingly even by second rank composers. What we have here is a group of chamber works from the earlier part of Amy’s career. The most recent works are over twenty years old. The title work comes in two version, opening and closing the disc. The opening version is for two clarinets, whose players also double basset horns – this is the alto clarinet with an extended lower range, much loved by Mozart and also Richard Strauss. Amy was attracted by the idea of their taking turns, working side by side, conversing, arguing and joining together. The actual melodic line is a descendant of that in Varèse’s Density 21.5 for solo flute or Messaien’s Abîme des oiseaux from the Quatuor pour la fin du temps, though, I am afraid, without the genius of either. This is followed by Jeux, for solo soprano saxophone. This is a revision of an early work originally written for oboe, and in a version which allowed some decisions about what and when to play were made by the performer – this was the aleatoric method, which was briefly fashionable then. This is intended to be playful but it requires some odd noises, including flutter tonguing, which can be quite pleasant, and multiphonics, which always seem rather nasty to me. En Trio in two movements for violin, clarinet and piano features a rather Schoenbergian kind of lyricism, with widely spaced, expressionist motives which build up into a kind of chase over a regular pulse. This is quite exciting but unfortunately it is not sustained. The second movement is a series of duets between pairs of instruments until they finally combine. This is mostly quiet and gentle, and as a whole this work is the most attractive on the disc. En harmonies for solo harp has to deal with the fact that the harp is closely linked in its construction to the traditional tonal system. This work is therefore more traditional than the others here, despite the use of some extended techniques. I hear the ghost of Ravel hovering behind some of it.
. . . d’un désastre obscur for mezzosoprano and clarinet was written as a homage to Jean Pierre Guezec, a composer who died young. It sets a line of Mallarmé, Calme bloc ici-bas chu d’un désastre obscur (‘Calm block dropped from a dark catastrophe,’ translated Keith Bosley) from Le Tombeau d’Edgar Poe. Boulez’ Pli selon pli carries the subtitle Portrait de Mallarmé and similarly sets single lines of his. This is a short work, expressionist in idiom and again using extended techniques. It sounds like a song left over from Schoenberg’s Pierrot Lunaire, or, to be frank, rejected from it. 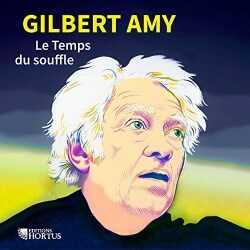 The second version of Le Temps souffle is a trio for the odd combination of violin, saxophone and trombone. If you think this is a combination that is unlikely to balance well you would be right: the trombone is always at risk of drowning out the others. The saxophonist has to play several different sizes of the instrument. The technique here is relatively traditional. I don’t hear much connection between this version and the one which opens the disc. The performances are by musicians who are or were connected to the Conservatoire in Lyon, who have sponsored the disc, and they are confident and enthusiastic. I suspect that this is music which it is more fun to play than to listen to. The recording, which sounds as if it was made in a small concert hall, is clear and good. The sleevenotes, in French and rather stilted English, give the background of the works but are rather short of information about Amy himself. I have tried to be fair but I found this a disappointing disc and I shall not be continuing to explore Amy’s work.